Kirstjen Michele Nielsen (born May 14, 1972) is an American government official and national security expert. 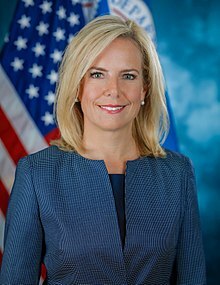 Nielsen was the 6th United States Secretary of Homeland Security from December 6, 2017 to April 10, 2019. Before, she served as Principal Deputy White House Chief of Staff to President Donald Trump from September 6, 2017 to December 5, 2017. She has informally performed the role of Deputy Chief of Staff since John F. Kelly became White House Chief of Staff on July 31, 2017. Nielsen is the founder and former President of Sunesis Consulting. On October 11, 2017, President Donald Trump nominated Nielsen to be the new United States Secretary of Homeland Security. On December 5, 2017, the Senate confirmed her nomination, by a 62-37 vote. She resigned on April 7, 2019. Nielsen was born on May 14, 1972 in Colorado Springs, Colorado. She was raised in Clearwater, Florida. She graduated from the Georgetown School of Foreign Service and earned a J.D. degree from the University of Virginia School of Law in 1999. Nielsen served during the President George W. Bush administration as special assistant to the president and as senior director for prevention, preparedness and response at the White House Homeland Security Council. She also ran the Transportation Security Administration's offices of legislative policy and government affairs, a section she started. Nielsen previously served as John F. Kelly's Chief of Staff at the Department of Homeland Security. She has informally performed the role of Deputy Chief of Staff since Kelly became White House Chief of Staff on July 31, 2017. On October 11, 2017, President Donald Trump nominated Nielsen to be the new United States Secretary of Homeland Security, replacing John F. Kelly. On December 5, 2017, the Senate confirmed her nomination, by a 62-37 vote. Nielsen created the practice of separating parents and children accused of crossing over the U.S.–Mexico border illegally. Nielsen resigned on April 7, 2019, and Kevin McAleenan, the then U.S. Customs and Border Protection Commissioner, became Acting Secretary. ↑ Kutner, Max. "Who is Kirstjen Nielsen, Trump's reported pick for Secretary of Homeland Security?". Newsweek.com. Newsweek. Retrieved 11 October 2017. ↑ 3.0 3.1 "Trump expected to nominate Nielsen as Homeland Security secretary: official". Reuters. 2017-10-11. Retrieved 2017-10-11. ↑ 4.0 4.1 "Trump expected to name Kelly's White House deputy as DHS secretary". POLITICO. Retrieved 2017-10-11. ↑ 5.0 5.1 Washington Post Staff (December 5, 2017). "Senate confirms Kirstjen Nielsen to head Department of Homeland Security, installing a close ally of John F. Kelly". Washington Post. ISSN 0190-8286. Retrieved December 5, 2017. ↑ "Kirstjen Nielsen '99 Tapped for Top Post at Homeland Security". October 11, 2017. ↑ "Trump Defiant as Crisis Grows Over Family Separation at the Border". The Washington Post. June 18, 2018. Retrieved April 7, 2019. ↑ "Was the 'Law to Separate Families' past in 1997 or 'by Democrats?'". Snopes Fact Check. Retrieved April 7, 2019. ↑ "DHS Secretary Kirstjen Nielsen resigns after clashes with Trump on immigration". CBS News. April 7, 2019. Retrieved April 8, 2019. This page was last changed on 9 April 2019, at 05:06.